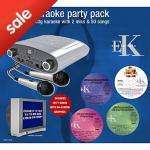 Plug and Play Karaoke CDG Player including 2 microphones and 4 karaoke discs containing 50 tracks. Perfect for family parties. 50 tracks from different genres. There's something for everyone to sing. Can this be used as a p.a system w/out song CDs etc? you probably should add the £4.95 into the price. The OP doesn't need to do that because you can collect in store for free. My only concern in buying this would be are there any decent tracks, and how easy would it be do get CDs with more tracks that are compatible with this. only free if order exceeds £25. Super silly price, bought one for my niece's birthday (I'm sure the parents won't thank us) and one for my wife's care home - they'll love it! Super silly price, bought one for my niece's birthday (I'm sure the … Super silly price, bought one for my niece's birthday (I'm sure the parents won't thank us) and one for my wife's care home - they'll love it! do u know if it can just be used as a p.a system? - to just talk into to entertain an audience? do u know if it can just be used as a p.a system? - to just talk into to … do u know if it can just be used as a p.a system? - to just talk into to entertain an audience? this is a home karaoke system. so I would guess it would use the tv speakers, can't see it having audio outputs tbh. Yes......if you plug it into an amp and speakers. this is a home karaoke system. so I would guess it would use the tv … this is a home karaoke system. so I would guess it would use the tv speakers, can't see it having audio outputs tbh. It has got phono out. please anybody let me know can I connect my speakers? can i connect with speakers? Get a phono out lead and plug it into an amplifier, then connect speakers. please explain how to do that. can i buy amplifier? how much that. You just need to run 2 phono (1x red + 1x white leads) from the karoke machine into your Home HI-FI Amplifier aux in socket that take signals into it the HIFI. Simple as that i think. Amplifiers can cost anything from about £15 for a budget tinny box to £1000's for state of the art amps. ANY WAY OF GETTING FREE DEL? EVEN TO STORE, OTHER THAN SPENDING OVER £25? No. Well maybe you could order something worth £10, and then return it for a refund.